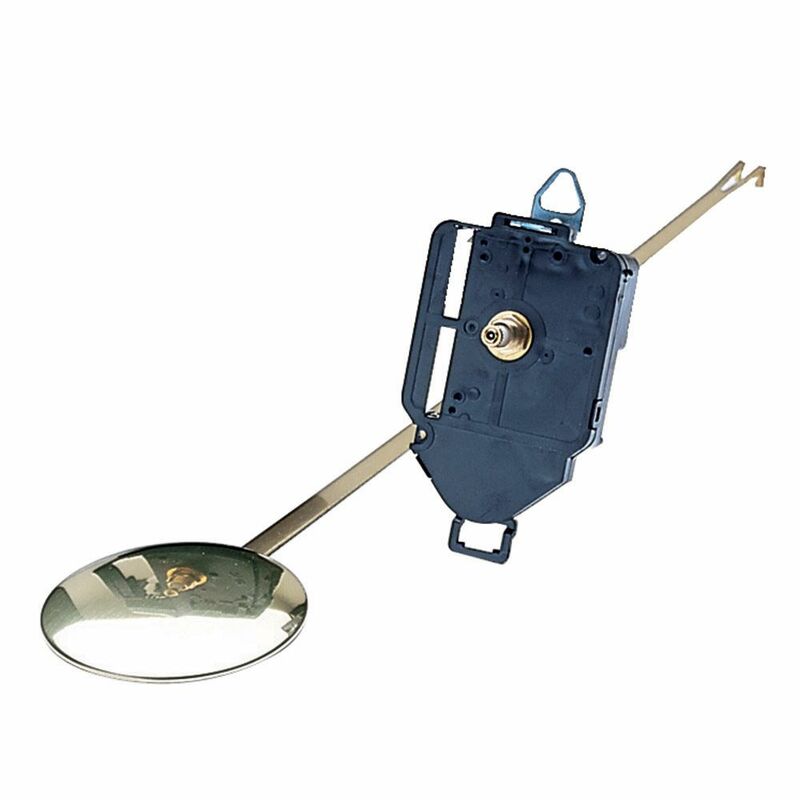 This quartz clock movement and pendulum set operates on one AA battery (not included). 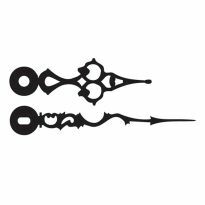 Use this set for any clock blank with a face up to 3/8" thick. Started right up and keeps excellent time. Love it. My 40 year old 35-day windup clock's mechanism broke and with a few washers as spacers, I was able to mount the Quartz Clock nd pendulum. So far the time has been in sync with the internet clock. stopped working. Wife happy. Since local store did not carry it was ordered through that store and got free shipping. Nice. Product is as described. Had no problem installing and is keeping great time. Excellent product for the money. I like this movement because it works well and is not noisy. You are a good company and I would recommend buying movements from you without hesitation. I replaced an old movement in a clock I built with this one. It's a great way to convert a clock that isn't working any more. It's fast and easy. The quartz clock movement and pendulum arrived and was very easy to replace the old movement and pendulum in less than 15 minutes. Rockler is a good company with good products. The clock motor was easy to install. I used to old hands and the old pendulum. The clock looks like it never stopped working. Beautiful. It's hanging on the wall above my computer desk ticking away and letting me know that all is well. I'm delighted with it and the service Ihat you gave me to receive it. Fit perfectly and works great. New shop clock. Note that the pendulum is a carpenter's pencil. Quick delivery. Exact replacement. Took minutes to install. This part exactly replaced my 20 year old parts that had quit working properly. The delivery was rapid, the installation was easy, and now we can tell time again! 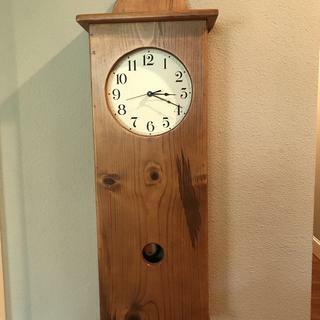 Cherry wood clock with a crape myrtle face numbers are burned in. Clock works well and install was easy. Made in USA. I ordered it hoping it would replace a 25 year old movement and when it arrived it was the same movement. Thanks. Excellent in every way. Very fast service to get the movement. And best of all it keeps perfect time! 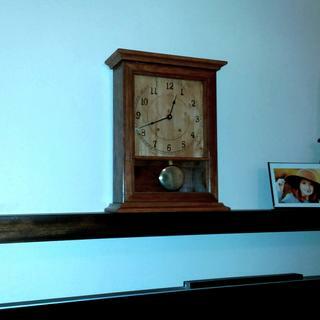 The installation in the clock went smoothly and it matches the original pendulum perfectly. Can't be happier. Glad to have found Rockler Woodworking and Hardware Company Definitely will use them again when I have need for other things. Highly recommend them. Purchased this item to fix a clock with a similar mechanism. Works great. Would recommend this item. This was a replacement for a movement I had damaged. It was an easy install and is working just fine. The unit does every thing it was advertised to do and its accuracy is superb. The movement fit well into my clock and keeps very accurate time. My order came quickly and was easy to install and now I have a functioning pendulum wall clock again. I used it to repair a movement that failed. say to adapt and use. Easy to install, worked like a champ! School House Clock is no longer truant! our very old classroom clock hoisted the white flag after 30 years of service. Although not an exact replacement , with a few adjustments this movement and pendulum hasn't skipped a minute. Highly recommended! Works very well. Would strongly recommend it. Great product and great service from a great company. The quartz movement is keeping perfect time, and the pendulum moves as expected. Great product! I purchased this to replace a 20 year old movement. Installed it installed the battery set the time and have looked back. I am very pleased with my purchase and will visit Rockler again for future needs. Very satisfied with this purchase and the speed of delivery was impressive as well. Would not hesitate to recommend this to anyone. My clock is working like a charm and keeps accurate time. Delivery was quick. The clock mocement was easy to install and is very accurate. This replaced a mechanical movement that was noisy, inaccurate and required winding. I purchased this movement to go into my first clock. It works perfectly and really compliments my woodwork. 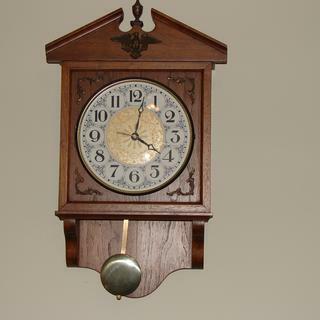 Purchased this product a few weeks ago to rejuvenate an old wall clock. It's hard to believe this clock would keep such accurate time after replacing the movement. I'm very satisfied with the product and fast shipment. Easy to install, keeps time well. Replaced movement on wedding present given 40 tears ago. Perfect fit, easy installation. Pendulum not as nice so used the original. Accurate,may need one adjustment later. I used this inexpensive quartz/battery pendulum movement to replace the original wind-up pendulum movement in a wall clock. I didn't want the much greater expense of a real replacement movement. This is the second instance I've had of this exact item, the first one's pendulum stopped after a couple of years. The new one is going strong. I hope it lasts longer. 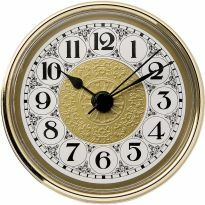 I ordered this as a replacement of a similar movement which was in a clock which we had purchased, and which had failed after several years of use. This product did not come with installation instructions-- hence 4 stars instead of 5-- but I am fairly handy, figured out the installation, and now it keeps perfect time. 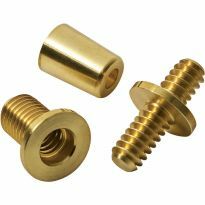 I recommend this product-- but be sure to pay close attention when you are disassembling the movement you are replacing. I purchased the clock works and when it arrived I installed it in an old non-working clock. I has been working great ever since. It keeps good time too. I appreciated the fast delivery. 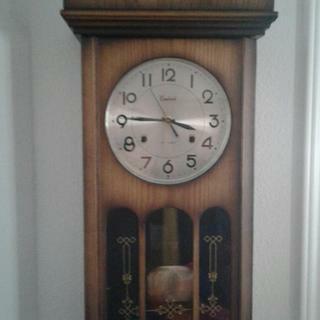 I plan to purchase more clocks works to put in other &quot;old non-working&quot; clocks I have. Try as I may, I could not get the pendulum to work. Don't know if I am doing something wrong as no instructions were included. The quartz movement works fine. The complaint we have is that the pendulum doesn't keep timing with the second hand at all. In fact this seems to be more of a cosmetic thing vs an accurate item. The clockwork itself keeps time perfectly (with a bit of tweaking of the hands we purchased), but as stated the pendulum doesn't remain in constant motion. It's also poorly constructed and feels very cheap. Due to poor lighting a video would not show up properly. Shaft was misthreaded, nut would not go on. Difficult to contact customer service, and had to wait for them to mail (rather than email) me a return label. Does not function properly. Bought a quartz movement without the pendulum at the same time and it worked just fine! I never could get this clock to work reliably. Clock works will not keep running. I installed works in clock. It ran perfect for 12 hours and stopped. I can restart it by adjusting the time and it will run for one or two days and stop again. I have ordered a different brand to replace it. To replace one that quit. needed to repair mantle clock that my dad built when he was alive. It looks closest to what I have in my clock. You had exact items I needed. what happened to my free shipping if over $35.??? Clock's mechanism is not working, and I saw that this looked like a good match. For repair an old clock. All previous reviews were in very good standing. This has the long pendulum swing arm and should be perfect for my 40 year old clock. Recommended as part of a woodworking plan. Replacement for my dead clock. To replace movement in Regulator clock. I HAVE USED A NUMBER OF THESE MOVEMENTS IN THE PAST. EASY TO USE AND DURABLE SOME OF MINE ARE STILL WORKING AFTER 30 YEARS. The one that was on the clock stopped working. Replacement for a wall clock that had stopped working. mine was knocked over, and it died. Exact replacement for a worn movement in a clock I made 15 years ago. Great to be able to replace with the same movement and it lasted forever! Because I am replacing one in a clock. My friend has a clock that is worn out so I bought this for him..
is it a working (moving) pendulum? how long is the pendulum? BEST ANSWER: Pendulum is about 11.5" . It is a working moving pendulum but does not always move and I cannot figure out why. 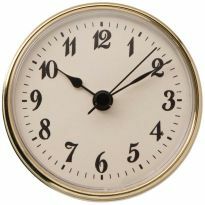 The clock itself, fortunately, does not depend on the movement of the pendulum and keeps good time. Yes, it is a 'working pendulum' in that it goes back and forth. It does not prevent the clock from working if it stops. I installed one in a clock a decade ago. The pendulum is about a foot long. Yes, it is a moving pendulum. The pendulum is constructed in a way that it can be made any length you need. The new pendulum before any adjustments is 15 1/2 inches. Is item no 28571 coming with hands and minute movement hand? BEST ANSWER: I think mine did, they were gold tone. You will want to match the hands to the clock face though. The hands don't cost much anyway. It's been quite awhile since I purchased but I used my existing hands. I believe Rockler offers numerous sets of hands if needed. It comes with two hands. The hour hand and the minute hand. Does it have the tick tock sound or silent? BEST ANSWER: It does not 'make' sound. If you put your ear against the case you might hear it ticking. how long is the shaft ? BEST ANSWER: Th shaft is 16" long and it is notched in 1 inch increments so you can make it as short or as long as you need up to 16"
The shaft without the big end on it is 15 7/8 inches long. It is scored to easily be adjusted to the size you need. The threaded part of the shaft is 7/16 long. Probably for a mounting panel thickness of 3/8. It comes 16" long and has 12 breakoff units of 1" each. is this a replacement for #28571? Does it come with "hands"? BEST ANSWER: I think I had to buy hands that matched the clock face. No. The hands are separate. What color is the pendulum? BEST ANSWER: sort of a Brass Silver reflective color, from my viewpoint. I did not use it. I'm sorry, I don't know, I didn't use it and recycled it. Will this movement work in a Linden wall clock? BEST ANSWER: I don't know about a Linden clock. I found it worked fine on my clock. I am guessing the hole through the clock face and the hands are pretty universal. I used my old pendulum because it was more ornate than the one with the clock. I Used this movement for a clock project I built. I have no idea of the dimensions needed for a Linden clock. 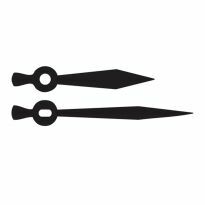 Yes you can trim the pendulum arm to desired length. 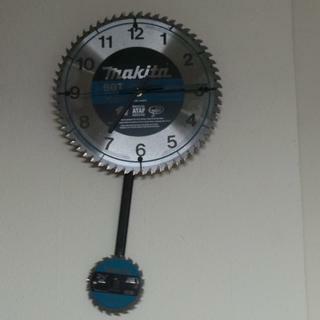 Should fit in the Linden wall clock. I do not know we just replaced the same one that broke when we moved. BEST ANSWER: It might depend on the battery but with an alkaline I have gotten around 6 months. I use battery from Costco and I get about 8 m.o to over a year. Several responses have indicated that the pendulum quits swinging. I'm wondering whether the length of the pendulum is a factor in its moving or not moving? BEST ANSWER: My pendulum continues to swing after 15 months. I wouldn't think the length would make a difference since the pendulum is not adjusted I order to speed up or slow down the clock. 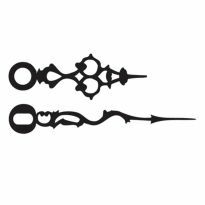 I didn't use the included pendulum since mine was larger and more ornate. I have had this problem. I think that it may have been an alignment issue. In my clock I can not see where the pendulum connects to the swing mechanism, but I did get it to start again after jiggling and fiddling with the pendulum. Have not had any problem with pendulum stopping.The length of the Pendulum only changes the speed of the swinging. Thanks. I seem to recall from a Physics class taken many years ago that the longer the pendulum the more effort it takes to move it. In this case. it would be the power of the motor that drives the pendulum. I cannot find the on/off switch on the back? There is no on/off switch on the back of the movement. The pendulum does have a latch to hold it in place. If you want to turn it off, take the battery out. Does this pendulum movement have a fitting on the end of the shaft for a sweep second hand? BEST ANSWER: Yes, it allows for a second hand. How far does the pendulum swing..side to side? 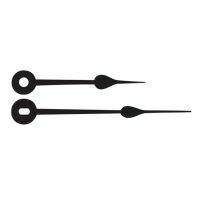 At the longest length of the pendulum 6 inches, 3 inches each side. The one we have has an arc of 4.5". what are the dimensions of the movement? Hi there, does the clock come with the washer and nut set to attach the hands? 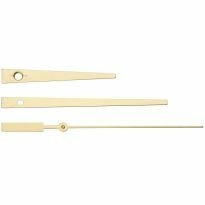 Do you have the hardware kit for a 28571 clock motor? Rafael, thank you for your reply. I found the nut that I needed at a local clock shop. I am looking for a movement that will handle a 24 inch long pendulum ? 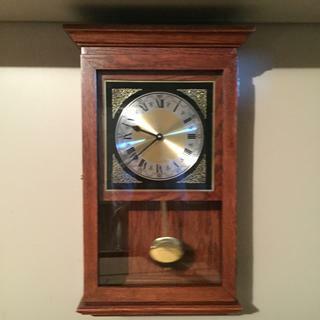 Will this fit an Elgin wall clock? The center hole on the clock is 3/8" as well as the section of the movement. Mine requires one AA battery and has quit working. There is no model number on the part.